The 2016 motionball Marathon of Sport Winnipeg was our largest fundraiser to date with 42 Teams of young professionals raising a record-breaking $100,000 net in support of the Special Olympics Canada Foundation! 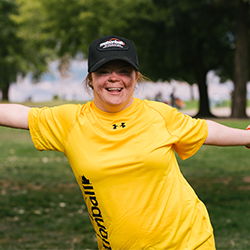 Participants enjoyed a fun day of athletic competition as they teamed up alongside local Special Olympics athletes and competed in a variety of sports & activities including basketball, soccer, flag football, ultimate frisbee, bench ball, and kickball! an Under Armour t-shirt, motionball hat, water, breakfast courtest of WoW! Hospitality, Pita Pit lunch, pizza & beer at the Marathon of Sport after-party, fundraising incentives, and most importantly, a chance to play with the Special Olympics Manitoba athletes who motionball proudly supports! To sign up as a Team Captain and pre-register your Team for the 2017 motionball Marathon of Sport Winnipeg, please email julie@motionball.com. For your company, this event is about team engagement, community building and meeting the cause on the ground. It’s also an incredibly rewarding day of fun. To learn more about Sponsorship Opportunities for the 2017 motionball Marathon of Sport Winnipeg, please email Julie at julie@motionball.com. motionball was proud to donate 70% of the funds raised from this event to Special Olympics Manitoba. This funding is directed to support programs for local athletes in the community. The remaining 30% is directed to the Special Olympics Canada Foundation, whose mission is to ensure the long term financial integrity of the Special Olympics movement in Canada and to fund long term athlete and volunteer growth.